Heading to Edinburgh for the Fringe? 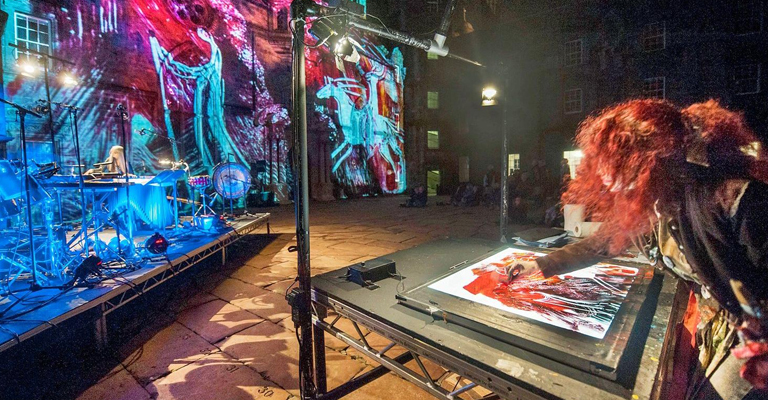 We’ve teamed up with Aurora Nova to offer two tickets to the amazing AniMotion Show at Gilded Balloon at the Museum, Edinburgh at 6pm on Friday 12 August. Returning in a new theatrical format that builds on 2015’s outdoor extravaganza, The AniMotion Show premieres Peace and War. Russian artist Maria Rud paints live to original music written and performed by virtuoso flautist David Heath and DJ Dolphin Boy. Maria’s dreamlike painted narratives are projected in real time. As the music shifts from pastoral to demonic, so the intensity of Maria’s brushstrokes and imagery trace a descent from peace to war. An adherence to improvisation and disruption keeps each performance utterly unique and unforgettable. The show runs from 4 August – 14 August, tickets are available from the Fringe website. Q: What is the name of the Russian artist who paints live during the show? Please note: this competitiion is for tickets to the event only and does not include travel or accommodation.